This week’s minorities in cartoons entry is Spawn, the anti-hero that was a landmark aspect of 90s comics. 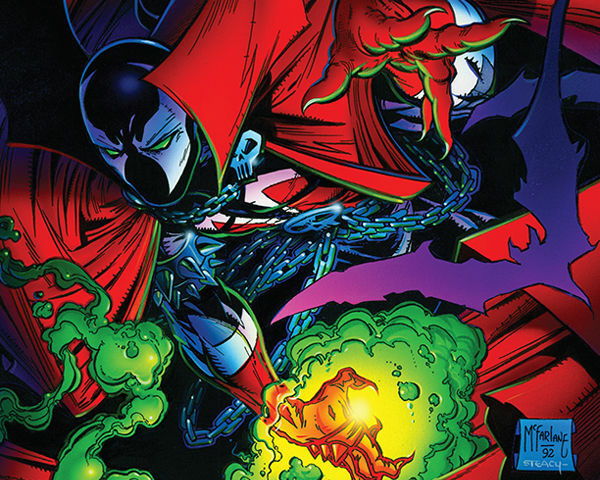 Spawn was created by Todd McFarlane. He first appeared in “Malibu Sun” #13 in 1992. Spawn’s backstory states he was originally an African-American man named Al Simmons. Simmons was a top CIA agent who started to question his duties/superiors’ motives. Feeling he was too dangerous, his superior arranged to have Simmons killed. Simmons (due to his questionable actions as a CIA agent) wound up going to Hades. Simmons wanted to be reunited with his wife again. Thus, he made a deal with a demonic being named “Malebolgia” to get sent back to Earth. Simmons made it back, but five years later and in an amnesiac state. By the time he partly recovered his memories, he’d found his wife had moved on. Not helping, of course, was that he now possessed a physically scarred appearance (partly hidden behind an elaborate costume), as well as a variety of demonic-based superpowers. As “Spawn,” Simmons fought the being that gave him his powers (who had an ulterior motive, of course), as well as the forces of Heaven and various other threats he encountered (gangs, etc.). Spawn proved to be a huge success, as one of the first major hits to debut from then-new Image Comics, co-founded by McFarlane. It also showed that Image’s creator-owned basis was capable of competing with titans DC and Marvel. Spawn also was a big part of the wave of grim, 90s anti-heroes that swept the decade, setting part of that era of comics’ tone. Spawn’s comic sales also were partly fueled by the comics speculator boom of the time, making “Spawn” #1 one of the more valuable modern comics. Spawn’s success and heyday were tied to that of the 90s anti-hero… emphasis on “90s.” By the 2000s, interest in the character (and in 90s-style anti-heroes) had started to wane; sales of Spawn’s comic dropped from their 90s highs. These days, “Spawn” is still published (as one of Image’s longest-running titles), but isn’t the sales force it once was. For July 2013, it ranked #150 in sales out of the top 300 selling comics in comic book shops. In comparison, current Image success story “The Walking Dead” ranked #12. Of course, Image as a company’s changed from the 90s as well. Image in the 90s emphasized anti-heroes like Spawn, as well as their own takes on superheroes (“Youngblood,” etc.). Since the 2000s, Image has diversified its material to include a variety of genres. A live-action “Spawn” movie came out in 1997. Michael Jai White played Spawn. HBO also aired an animated “Spawn” series in the late 90s; Keith David voiced Spawn.